H. Jon Benjamin's Failure is an Option: An Attempted Memoir Book | Nerd Much? Failure must be accepted to the point where we can make "this world a different place." 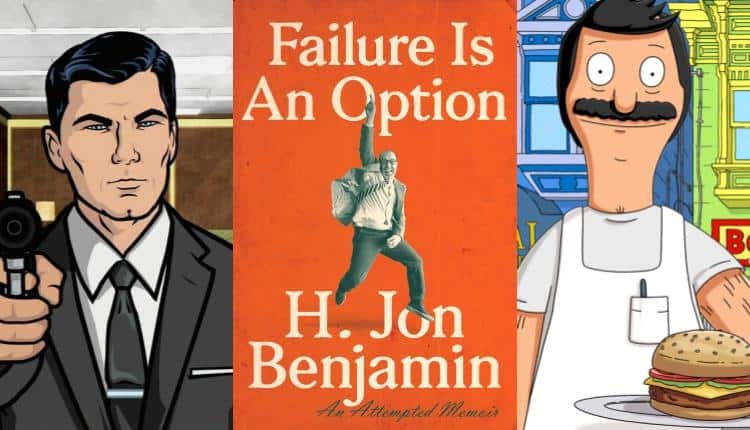 Failure Is An Option: An Attempted Memoir is book authored by none other than the voice behind Archer and Bob’s Burgers, H. Jon Benjamin. What the H stands for, Benjamin has notoriously kept secret and it is yet to be seen if he reveals the truth in this book. Judging by his sense of humor, however, he enjoys the mystery of it too much to simply reveal it so easily in a book. Failure Is An Option is a biographical book about Benjamin’s journey to success and how failure led most of the way. Failure, Benjamin claims, is just as important as your successes and should be treated as an option for exciting experiences and learning curves. If you can get behind Benjamin’s brand of humor, than this book is definitely for you. It purposely subverts commonly held notions and asks the audience to accept failures in life, love, family and career, as their own versions of success. As he states, this is difficult pill to swallow when our society states otherwise, but Benjamin assures us that failure isn’t nearly as bad as it is made out to be. Failure should never be the end of the world and it certainly isn’t something that should make us give up.